Two years ago, Hemphill Fine Arts presented a show of paintings by Steven Cushner and works on paper by William Willis. Now the two artists are again cohabiting the gallery, each showing the sort of work the other did the last time. Either way, the two men’s art is quite compatible. Both employ muted yet complex palettes and simple, even primal, forms. The paintings in Willis’s “Keeping It Alive,” executed in oil on canvas or occasionally wood, have a folkloric quality that seems utterly American. Yet his models include those 20th-century European painters and sculptors who streamlined and abstracted what they saw. One picture, which features jagged black and white shapes, is titled “Tree for Brancusi.” The most directly representational of these 12 works is a tabletop scene; it’s called simply “Still Life With Gray,” but a title that invoked Picasso or Braque would be apt. Such pieces as “Mountains and Rivers,” which turns the painter’s trademark zigzag sideways, have more of the great outdoors in them than is typical of his Parisian precursors. But in his quest for images that are both specific and universal, Willis follows the modernists’ path. 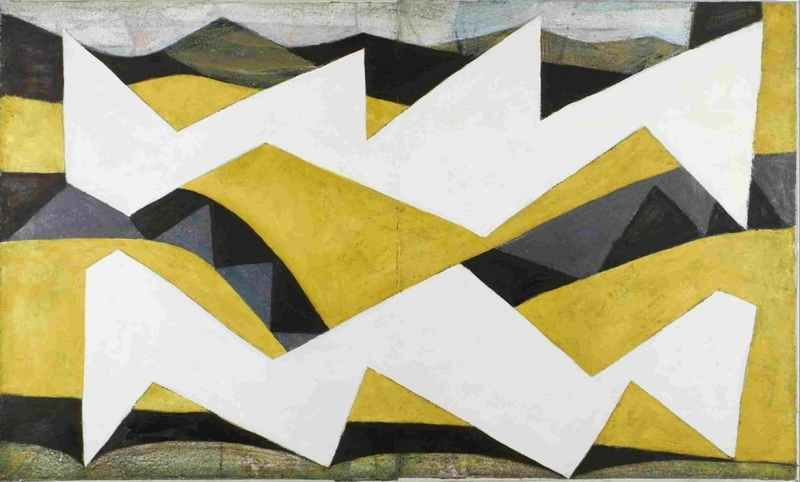 Cushner’s “Works on Paper” consists of nine untitled mixed-media paintings that are brighter and rounder than Willis’s work. Instead of angular shapes, Cushner employs ovals and spirals, suggesting shells, microorganisms and labyrinths. The watery colors have a childlike feel, although the compositions show adult powers of concentration. This combination, too, recalls the Europeans who transformed the visual arts at the start of the last century.